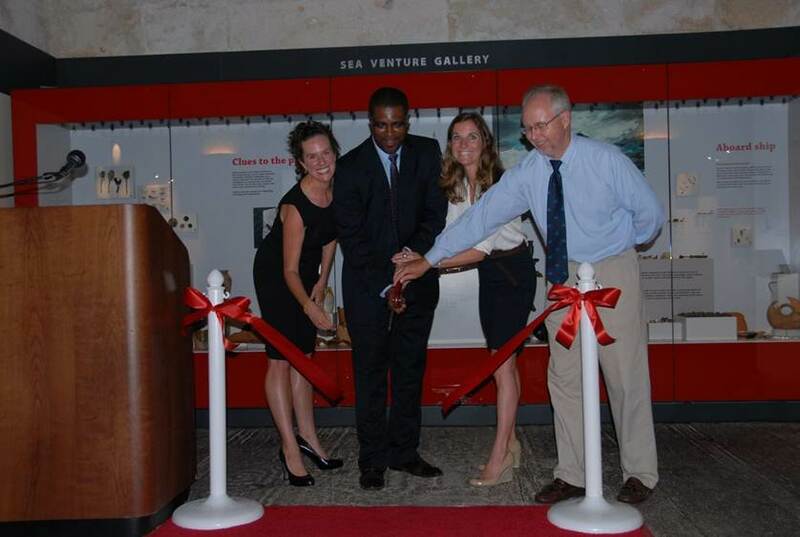 On Thursday [Sept 13] the ribbon cutting ceremony and formal opening of the Bermuda National Museum’s new exhibit “Shipwreck Island: Sunken Clues to Bermuda’s Past” was held in Dockyard. Public Works Minister Minister Weeks said: “Shipwrecks are one of Bermuda’s most important cultural resources. They are underwater museums offering the public…. tourists…..students…. and scholars a unique opportunity to investigate the remains of vessels that made our Western Hemisphere what it is today. “Remnants of Spanish Naos…English galleons….French frigates….American schooners….. brigantines…..paddle steamers…. steamships….gunboats…tugs… and racing yachts [to name a few] can all be found on Bermuda’s ocean floor,” continued Minister Weeks. “They all show an extensive cross section of maritime technology and cultures over five hundred years, thus putting Bermuda on the map as the ‘Shipwreck Island’ of the western Atlantic. “I would like to congratulate the Museum on their latest achievement: Shipwreck Island: Sunken Clues to Bermuda’s Past. The Museum has yet again expanded Bermuda’s cultural resource pool by providing a world-class exhibit that tells the story of Bermuda’s discovery and early settlement through the lens of shipwreck artifacts,” said the Minister. It is a pleasure for me to be here this evening to take part in the opening of this new exhibit at our National Museum. Shipwrecks are one of Bermuda’s most important cultural resources. They are underwater museums offering the public…. tourists…..students…. and scholars a unique opportunity to investigate the remains of vessels that made our Western Hemisphere what it is today. Remnants of Spanish Naos…English galleons….French frigates….American schooners….. brigantines…..paddle steamers…. steamships….gunboats…tugs… and racing yachts (to name a few) can all be found on Bermuda’s ocean floor. They all show an extensive cross section of maritime technology and cultures over five hundred years, thus putting Bermuda on the map as the ‘Shipwreck Island’ of the western Atlantic. Not everyone has access to these shipwrecks and their historical stories hence the importance of the work the Museum is doing. I would like to congratulate the Museum on their latest achievement: Shipwreck Island: Sunken Clues to Bermuda’s Past. The Museum has yet again expanded Bermuda’s cultural resource pool by providing a world-class exhibit that tells the story of Bermuda’s discovery and early settlement through the lens of shipwreck artifacts. In the process of developing the exhibit they have also restored this amazing 19th century ammunition magazine – an early work of a naval architect who went on to design the Royal Albert Hall and Victoria & Albert Museum in London. This is one of the significant buildings in the Dockyard that the Museum has been responsible for restoring and protecting. I would also like to commend the Museum for their long-standing work and unfaltering commitment over the past 30 years to the care and protection of Bermuda’s underwater cultural heritage and public education….and in particular, with Bermuda history and maritime heritage. Shipwreck artifacts were on display when the Museum first opened its doors in 1975 (in this very same building) and in the early 1980s the Museum became the custodian of the Bermuda Government’s collection of shipwreck artifacts. Since then the Museum staff and committed volunteers have catalogued, researched, cared for, interpreted, conserved and exhibited the Government’s collection of shipwreck artifacts. During this period, the Museum has also teamed up with leading overseas universities, conducted extensive archaeological surveys as well as excavated and recorded numerous shipwrecks. Their latest archaeological excavation came to completion this summer on the 17th century English merchantman, The Warwick, which wrecked at Castle Harbour in 1619. With such critical work being undertaken in the field of shipwrecks, the Ministry of Public Works is proud to have passed amendments to the Historic Wrecks Act 2001 that are intended to augment the protection of our fragile underwater cultural heritage. We hope Bermuda sets a powerful example to other countries where protection of underwater may not be as advanced. The Government is committed to its role in the protection of our underwater cultural heritage and hope that all of you can play your part in assisting us with this valiant effort. The Government under former Premier, The Hon. Alexander Scott JP, MP, was also pleased to be able to contribute a major grant for the renewing of the pathways and grounds in the Keep Yard surrounding this exhibition building. As I conclude I would like to say that I also see this exhibit as an invaluable resource for schools to educate our youth on Bermuda’s early history as well as being a gem for anyone, including locals and visitors with an interest in what lies on Bermuda’s ocean floor. Again congratulations to the Museum, its Trustees, Donors and Staff for adding another major display to enhance our cultural tourism economy. And thank you once again for letting me be a part of such an historic and exciting occasion.